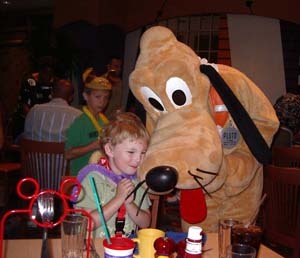 Disney's Paradise Pier Hotel has a daily character meal at the PCH Grill. We had decided to do this breakfast on our last day, Saturday July 1st, since we would need to return to the hotel to check out anyway. There were 2 adults and once child, aged 3 ¾, at this character meal. We had priority seating reservations for 10:30 that morning and checked in for those reservations at about 10:25. We were seated within a few minutes at a table for four. Alex was given a purple lei when we walked in the restaurant. Lei's are only given to the children. The PCH Grill is mainly tables with chairs and just a few booths. The first thing we noticed was the layout of the room which was perfectly set up for characters to easily move between tables. We were at an end, near the entrance, and up against the back of the buffet section. This was a great location with a ton of space in the aisles for the characters to visit. Within a few minutes of sitting down we had been visited by both Max and Minnie Mouse. Stitch had walked past our table twice without stopping but since Minnie and Max had come so quickly we were not concerned. Lilo left the restaurant shortly after we got there and was gone for more than 25 minutes. This is strictly a breakfast buffet with one exception: Salmon. Salmon is available cooked two different ways. Everything else on the buffet is breakfast related. Fresh omelets, with many choices to add to your eggs including shrimp, are available at the Lilo and Stitch breakfast. In addition to omelets were scrambled eggs, potatoes, bacon and sausage, breads, muffins, fruit and cereal. For the children there were Mickey Mouse chicken nuggets and tater tots. There was also banana's Foster French toast, Mickey Mouse waffles and more. Fresh fruit is also available; such as peaches, plums, oranges and bananas. There were no apples available on the morning we were there. The food at the PCH Grill was wonderful and the buffet table was frequently supplied with new, fresh food. The table service was wonderful. Our drinks were refilled without us having to ask which was nice. During breakfast there are many different games for the children to play with either Lilo or Stitch. Some are simple games and dances such as musical chairs. Musical chairs is played without chairs though. Instead the carpet in the restaurant has large circles that are used to play the musical chairs. 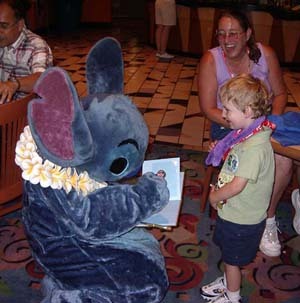 Stitch is always called to be at there for this special children's entertainment. After we had finished eating we still had not seen Lilo or Stitch at our table so I had to ask the character manager to send them over. Stitch came within 5 minutes and was absolutely wonderful. He grabbed Alex in a big hug and simply would not let him go. It was adorable and Alex really loved it. Stitch used many hand motions to talk to us, and never made us feel like he was forced to come to our table. He quickly became a favorite character for all of us. About 5 minutes after Stitch left Lilo came to our table. We were very disappointed with her. Her face has an expression that just doesn't look friendly. Sure, we know it is a mask, but the person behind the mask acted like she didn't want to be there. Basically she held Alex in front of her for a quick picture, signed the autograph book and left. She was at our table for no more than 30 seconds. Even with the surly Lilo and the wait for Stitch we really enjoyed this breakfast and highly recommend it. I am sure we simply caught Lilo on a bad day but the other characters and the cast members at this restaurant totally made up for that. 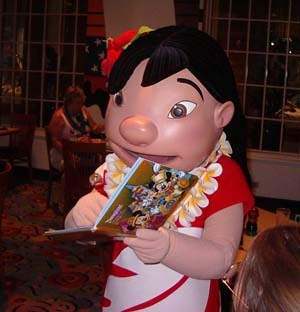 If you would like to do the Lilo and Stitch breakfast, you can call for priority seating 714-781-DINE.